Enjoy faster read/write speeds of 90MB/s and 70MB/s with the new, improved Flashair™ W04. This makes transferring data to and from your PC much quicker. Coupled with faster wireless transfer speed, this Flashair™ W04 is unbeatable. It is now approximately 2.9 times* faster at 31.4Mbps. 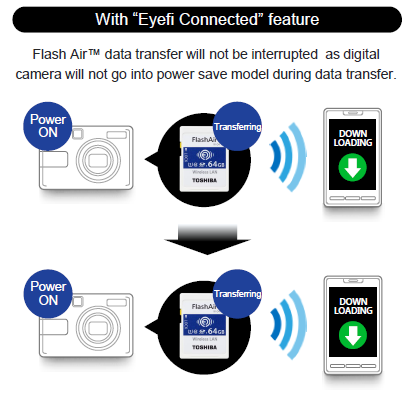 Photos and videos can be transferred at faster speed than that of normal Wireless-LAN equipped digital camera. No more interruption from auto power off! The new Flashair™ W04 comes supported with “Eyefi Connected” feature. 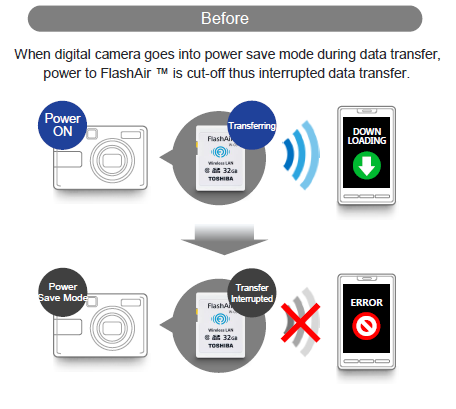 This makes wireless transfer with digital camera’s power management more stable, minimising data transfer interruption from the camera’s auto power-off function*. * Requires digital camera with “Eyefi Connected” feature. 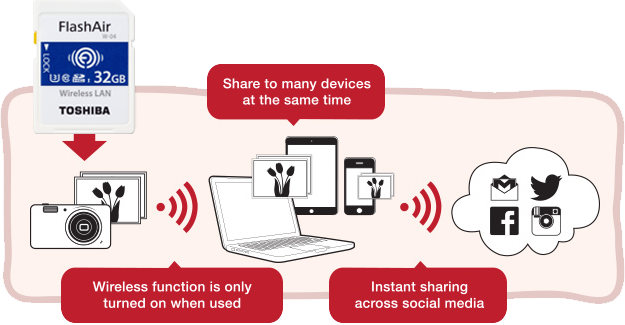 Share files and photos wirelessly without cellular network or Wi-Fi® access point. With FlashAir™, there's no need to pull out the SD card from your camera and upload the pictures to your PC in order to share them. The FlashAir™ is embedded with a wireless LAN chip which allows you to share your pictures via smartphones or tablets (up to 7 users in one go)! Simply download the Android or iOS app below. Share a wide range of files*1 such as audio and text files. It also works with devices such as IC recorders to share recording of meetings. * Photoshare allows you to show only photos and videos from a specified date in the list of photo and video thumbnails. Please change the initial SSID and the initial password for Photoshare through the FlashAir™ App for Android or iOS before each use of Photoshare. Please note that your files other than photos and videos specified by you on Photoshare may be unexpectedly accessed by the users with whom you have shared your password for Photoshare depending on the way to access your FlashAir™. 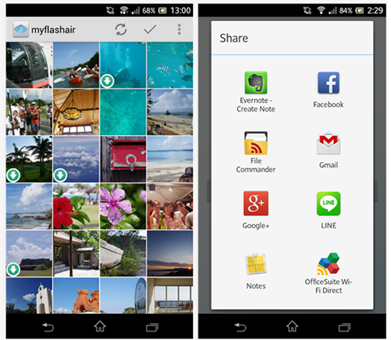 1 No limitation on file type but only files compatible with FlashAir app and browser can be downloaded. Transfer images with just a few touches from digital camera onto bigger screens like tablet and PC. This allows you to check your work easily, so you can focus spending time on doing what’s more important!